Vibrant green colour, smooth creamy taste. Surprisingly versatile; use drizzled cold or use in baking light sautéing, stir-frying and even deep-frying. High quality, cold pressed & carefully filtered. Amazingly, the soft and delicate avocado can produce a fabulous, all-round oil for cooking and various food preparations. It can be heated up to 190°C, so it is suitable for deep frying and stir fries. 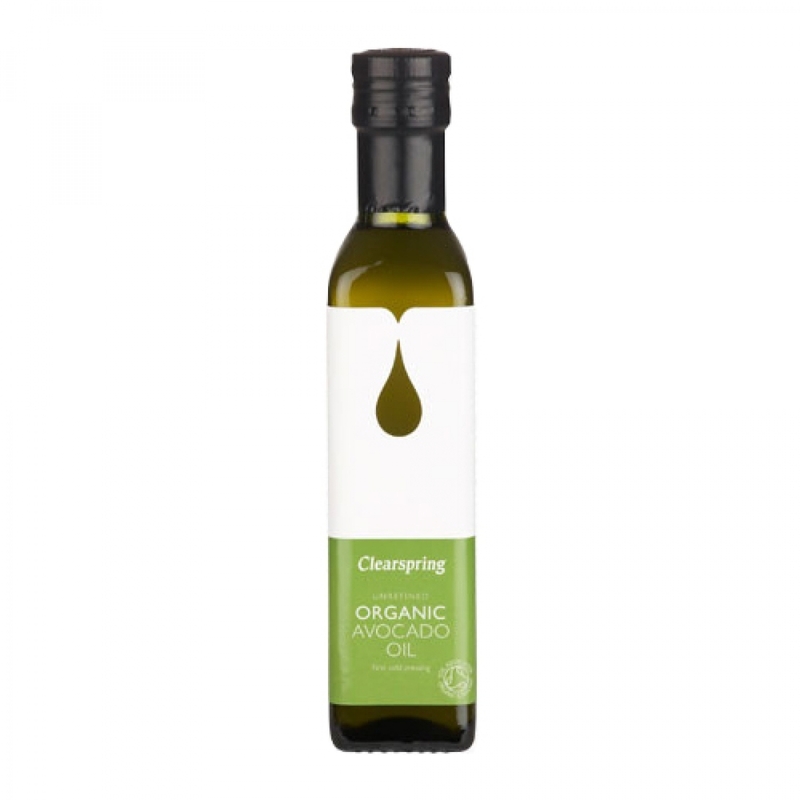 Clearspring Organic Avocado Oil, has been first cold pressed using the pulp of Chilean avocados. It is then carefully filtered. No chemicals are used during the entire process. Avocado oil is used as a cooking oil: use instead of vegetable oil or butter when pan-frying. You can even use it for deep-frying. Avocado oil remains stable and smoke-free even at very high temperatures. Avocado oil can also be used in salad dressings, as with olive oil. Avocado oil is also commonly used in cosmetic treatments such as face masks and cucumbery eye treatments. Clearspring is a privately owned UK company established in the 1980s to distribute great tasting traditional foods that support good health; promote sustainable agriculture; and provide economic stability for producer communities. The Clearspring goal is to get organic food back on the dining table, so that you can enjoy the same quality of foods as your grandparents did. You will find that each of Clearspring food products has a distinct flavour and quality that comes from using the finest quality ingredients and respecting local food traditions. Meeting the most stringent food and safety standards is central to the Clearspring philosophy to deliver exceptional food to their customers. At Clearspring, they believe that health is too important to be comprised. That is why their standards are never lowered in order to meet a price. Many of Clearspring foods offer exceptional health benefits. Please take note that the waiting time for Backorder items is around 1-3 weeks from the date of payment, subject to stock availability. For orders outside Malaysia, there might be a shipment delay especially during peak holiday seasons. We will try our best to expedite all orders but in any cases that Backorder is cancelled, full cash/credit refund will be given. We sincerely appreciate your kind understanding and patience. Copyright © 2019 by Green Wellness. All Rights Reserved.